(17 years, 6 months and 3 days) Origins date tae the 1980s. 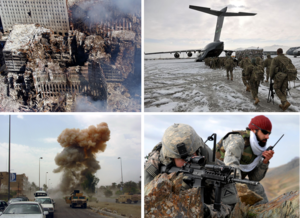 The War on Terror, an aa kent as the Global War on Terrorism (GWOT) is a term commonly applee'd tae an internaitional militar campaign which stairtit as a result o the 11 September 2001 terrorist attacks on the Unitit States. This resultit in an internaitional militar campaign tae eliminate al-Qaeda an ither militant organisations. The Unitit Kinrick an mony ither NATO an non-NATO naitions sic as Pakistan pairticipate in the conflict. ↑ ETA "Presidential Address to the Nation" (Press release). The White House. 11 September 2001.